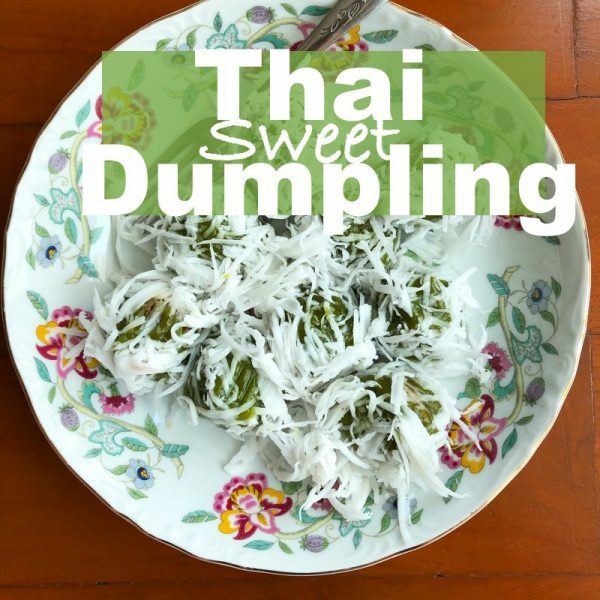 For those who are familiar with the steaming hot, soft and fluffy rice – a staple in most Thai meals – this type of summertime rice might appear to be a bit of a surprise. 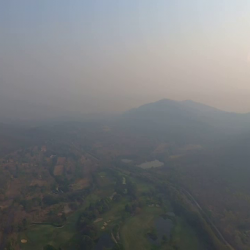 Summertime in Thailand, needless to say, can be brutal. Scorchingly hot weather, perennial blaze of sunlight, omnipresent body sweat. 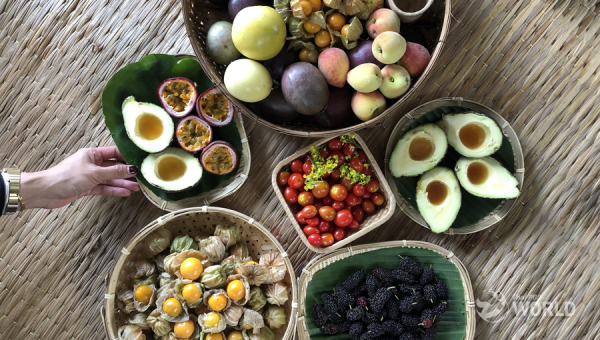 But then, this is also the time we see local restaurants featuring the season’s special meal of ‘Khao Chae,’ or the Thai traditional chilled rice. 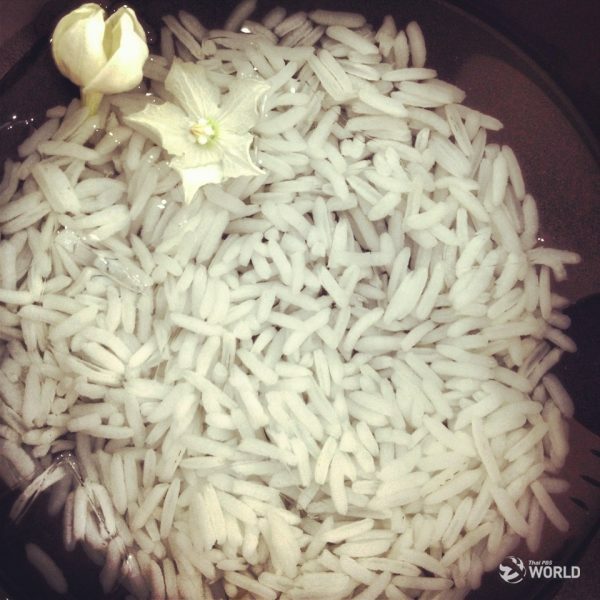 The rice, in this case, is served cold, in chilled and florally perfumed water and, sometimes if required, with some ice cubes to increase the level of coldness. 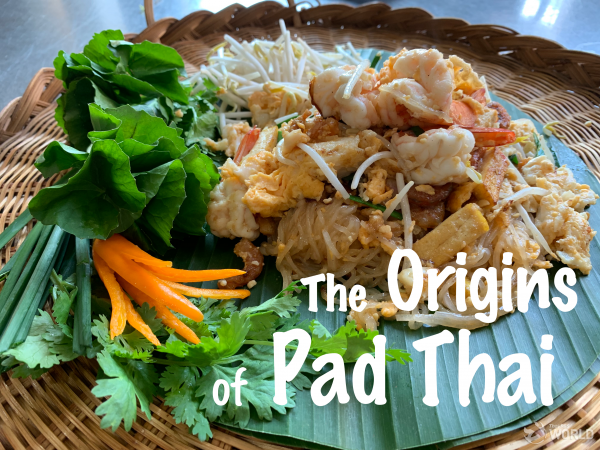 Khao Chae, in all its peculiarity, is a very historic meal of Siam. Stories had it that this particular eating was an influence from ancient Mon people of Burma. It even carried some mystic elements of being a meal used to worship deities, a way of human to cordially ask for offspring. 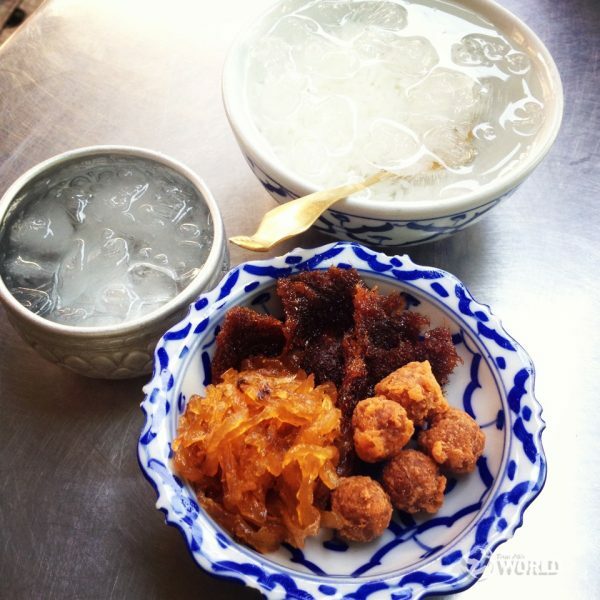 But now, understandably, Khao Chae has become a delicious staple to cool off the midyear extra warming in the country. Khao Chae is a meal in itself. It is a set of rice that is especially cooked to just al dente, and then hand-scrubbed only gently through water to polish of the excess starch. The rice is then served chilled along with a set of sweet and salty sides. The rice that is cooked and polished well will retain its shape and texture better. Crunchy, still a bit chewy, which will make it pair better with the accompanying savouries. 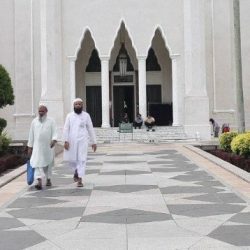 If you think the preparation of the rice is painstaking already, wait until you hear how they prepare the assorted savoury sides that go along with it. Typically, there are about five different savouries served in a set of Khao Chae. The centrepiece is the steamed green chilli or ‘Prik Yuak’ which is filled with minced, seasoned pork, and steamed to cook. To serve, it is then wrapped with hand-sprinkled egg blanket called ‘Room.’ The minuscule patterns of this blanket is also a connoisseur’s indicator if this set of Khao Chae is good enough or not. ‘Look Kapi’ is shrimp paste balls, hand-rolled and deep-fried in a light egg batter. A blend of good shrimp paste and dried fish, simmered and stirred until forming with palm sugar. The balanced tastes of Look Kapi are also strictly required in a good set of Khao Chae. Stuffed shallot with a filling of hand-pounded dried fish, deep-fried in light flour batter is also another key item. Single-bulb shallots are preferred in this case thanks to its wholesome look and hallow space for ample stuffing. For something sweet and salty, there are candied radish and pulled jerky – pork or beef. These last two are staples, least in elaborateness, but not in tastes. 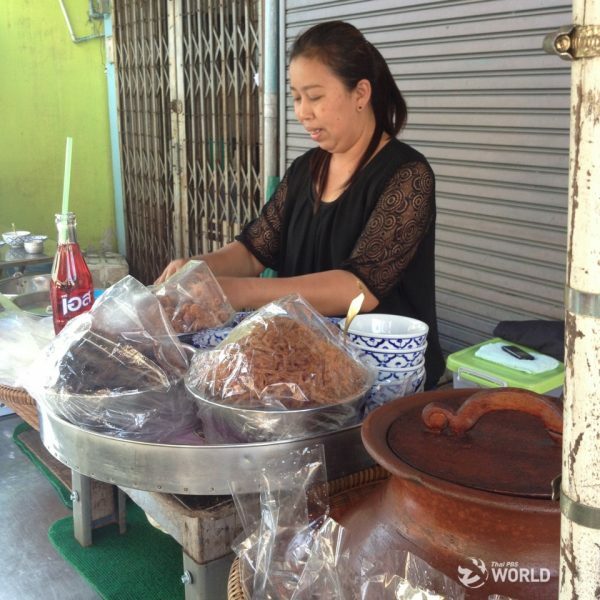 They are served even in a simpler, layman version of Khao Chae sold off the market in the province of Phetchaburi. But Khao Chae is not only about rice and savoury sides. 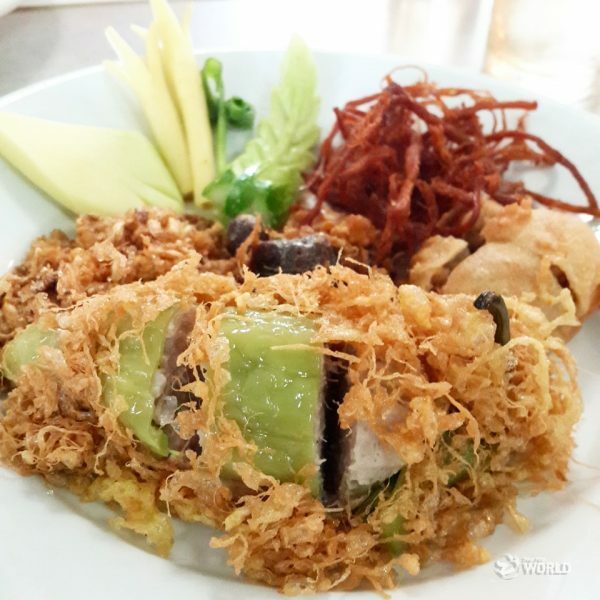 As far as Thai food is concerned, a good meal or a good plate of Thai dish must contain a variety of tastes. Thai food is known for having as much as 10 flavours. From salty, spicy, and sweet to sour, oily, and bitter. Texture wise, we are also keen to bring together crisp freshness and chewiness, juxtaposing something herbal to spice up the whole affair. Khao Chae is the same thing. Apart from the rice and the aforementioned savouries, which are mostly heavily salty and sweet, the set is also accompanied by assorted fresh vegetables and herbs. Beautifully carved green mango is served here, along with a bunch of beautifully curled green onion. Ginger roots, or Krachai, carved into delicate Ylang-Ylang buds, are to provide a nice refreshing break between bites. 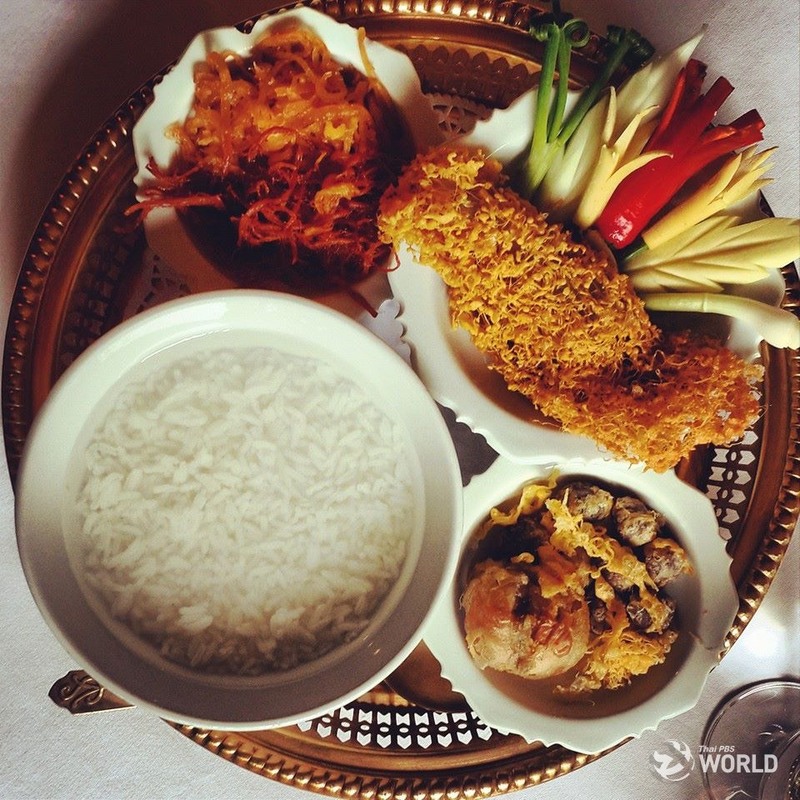 In Bangkok, where things tend to be more fussy, Khao Chae is usually served in an embellish way. Versions differ, looks differ, and savouries and sides can be also slightly differ, depending on the original recipes and roots. Summertime rice is usually available in good Thai restaurants starting the early days of summertime. Usually mid March until the first drop of rains, or about June. But if you are looking for a year-round Khao Chae, just go to Phetchaburi – the province known as a sister province of Autthaya, hence a very important cultural cradle for Thai traditions. There, at their main fresh market from early until late morning are a couple of stalls selling their Phetchaburi-style Khao Chae off terracotta pot. 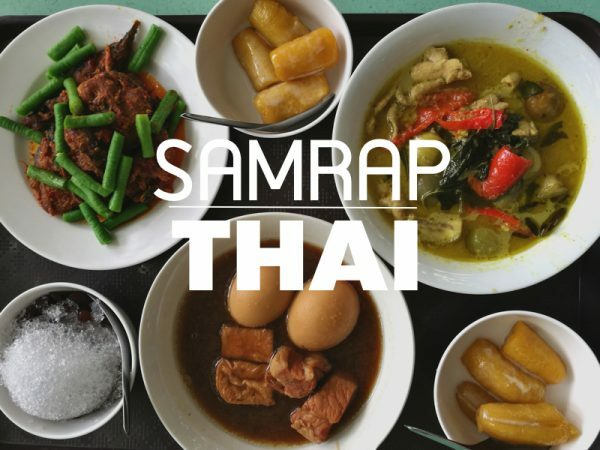 The savoury sides might not be as elaborate as the Bangkok’s version, but this is how local eat their Khao Chae, which is also a refreshing tradition in this charming province just a couple of hours away from the capital city.